Licensee ID what is this? 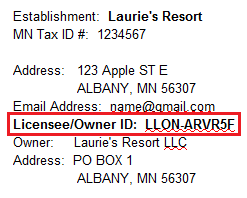 To Pay Your License Fees, enter your Licensee / Owner ID into the Licensee ID box. If you have questions about this payment or need assistance, please call Stearns County Environmental Services at 1-800-450-0852 or 320-656-3613. (c) 2000-2019 HealthSpace USA, Inc.